The Black-collared Barbet (Lybius torquatus) is wide ranging in Sub-Saharan Africa and is often one of the first birds identified by those learning bird identification and bird calls in Southern Africa. This is not only due to its striking markings but also its remarkable distinctive call. The Black-collared Barbet is one of only a handful of birds which 'duet' which it uses on a daily basis, this distinctive call is that of a 'too-puddly too-puddly' This song does not seem to vary and no singular songs seem to be heard. The "too-puddly" song is actually an 'antiphonal' duet. That means that one bird out of the pair sings the first note, then the other bird in the pair sings the second note. To those that stand and listen, this does not sound like it comes from two different birds but one solitary song. 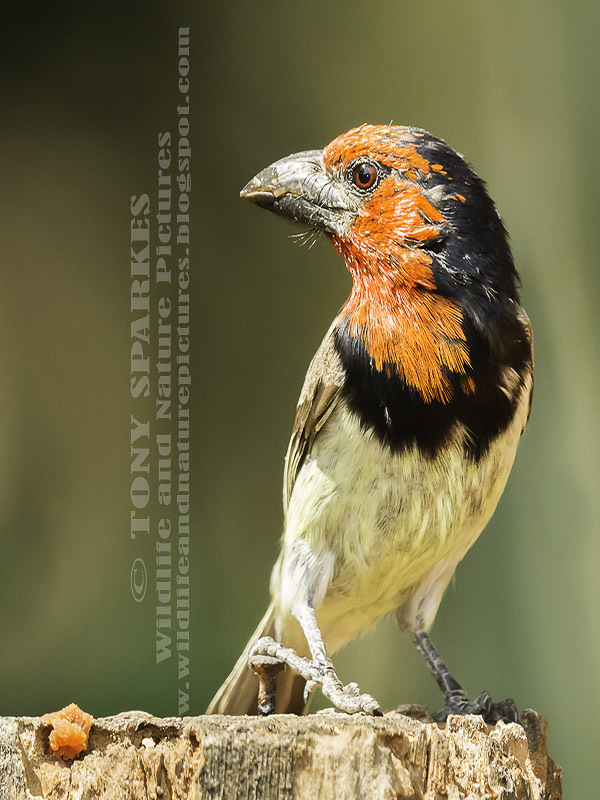 The Black-collared Barbet (Lybius torquatus) is a common resident in South Africa and regularly seen in woodland, forest, savannah and local gardens. Not a large bird but the Black-collared Barbet has a large black conical beak, distinctive red head (sometimes the 'head' can also be seen as a rare yellow morph) and a 'black collar' which gives it its name. Living and nesting in holes in trees the Black-collared Barbet is often parasitised (in this case eggs are laid in its nest by another bird) by the 'Lesser Honey Guide'. Living on a diet of mainly fruits the Black-collared Barbet has also been known to supplement its diet with insects and nectar. Finally, another interesting fact about the Black-collared Barbet is its toe arrangement, it has what is known as a 'Zygodactyl' arrangement. This means it has two toes pointing forward and two toes pointing backwards, similar to that of Woodpeckers, Parrots and most tree trunk 'arboreal' (tree dwelling) climbing birds. This differs somewhat to the group of birds we define as 'passerines' or perching birds which have 3 toes pointing forwards and one backwards.